VLSI Major Classification (Learn VHDL with Naresh Singh Dobal series). 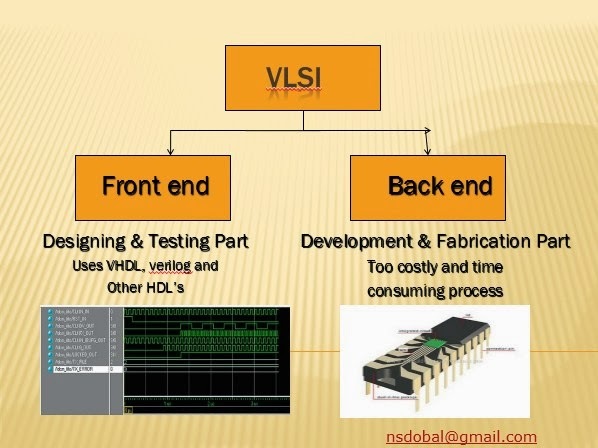 VLSI Front end considers all the logical designing and verification part, In simple words we can say all the work up to the Gate level or RTL Level designing and verification considered as VLSI Front End Designing and Verification, We have multiple ways for logical designing of IC (Integrated Circuits)’s in VLSI Front End, For Example in early days when we have very less chip complexity, designers used Manual Logical Designing and they used concept of number system, Basic Gates Concept, K-maps, Boolean Mathematics, expression handling etc. As the time passed and according to the Moore's law chip complexity has been increased by multiple times and at that level logical designing was not manageable using manual designing, So Schematics based Designing was discovered, and we started work on computers and simulators, and We design our systems using Pick and Place concept. In this concept we have some type of tool bars and all the basic components and elements like basic gates, multiplexer, ALU, flip flops was defined in the tool bars with there properties and user just pick that component from the list and place it into the computer screen and then route all the components with the help of wires. But at this level one thing is common and this is designing methods, Using this concept we only optimized the verification concept and this saved a lot of time and money. Because verification needed more than twice of efforts (in term of time and money) as compare to designing. But again these things failed as the chip complexity increased, So researchers invented a totally different concept of designing and verification. And that concept was HDL Based Designing and Verification. And that concept was perfectly suited at that time for complex chip design (or high density chips). These things reduces the Designing Time and Cost and mainly the verification time. But now again HDL based designing is exactly where, as the schematic based designing is as before 15 years, because in now a days hundreds of pages of codes are not uncommon and this is really very difficult to handle and manage designs and verification plans. So now the question is What Will be the next ???????? Second is VLSI Back End, that consider all the designing and verification part after logical designing means Gate level or RTL level designing, That may include Floor Planning, Place & Route, and All the foundry work like fabrication, packaging etc. are also comes in VLSI Back End. Thanks man ... learned alot from this ... actually i am a begineer in the field of VHDL and was really confused about these two terms. Nothing is complex in these two terms, all the logical designing up to the RTL / Gate level comes in Front End, like how you make algo, reducing gate complexity, Minimizing delay time, coding, simulation etc. Back End - This is all about the fabrication part, like physical designing, layout, full fabrication process etc. thanks Mr. am still i dont know this difference..
actually really i dont know what are that..just am preparing for job in this domain with mtech background..interveiw questions regarding vlsi plse.. Very nicely explained@Naresh Singh Dobal. but some idiots like @sagar still dont know the difference though he is having a M.tech degree..Shame on such kind of people we have in india,Thats why India is lacking in the field of VLSI. thank you sir for great info...but as B.E fresher i have few doubts.whether vlsi training courses give the training of both front-end and back-end design or only the front-end.I am interested in physical designing field,are there any companies exist related to my interests.if yes please mention few of them. sir,can u explain floor planning in detail...?? Thanks for this info sir. Which domain is having brighter future? verification or physical design? I am asking which is the best place to learn the fronted? Can one switch from front end to back end part aftr being experienced.. Thank u .. Was very clearly explained.... Thank u very much. I wonder if you add the tools specifically used in front an back end would be very helpfull..
Talking abut a better future for VLSI people in India- verification is the answer. There are no fabrication industries in India. Also the demand for verification engineers is more than that for design engineers. But design engineers are definitely paid more than verification engineers. hello i am a student from NIELIT calicut, doing PGD in ASIC design and Verification,i am not so good at logic, sir will i be able to secure a descent job, what is better frontend or backend ? is RTL a good option for women? you told it in very easy way. really good job done by you. Thank you for such a nice blog. The blog beautifully describes difference between the two. Though the backend processing is little difficult but the blog describes it well. You have given a very clear explanation about vlsi front end and back end,as many people are confused what is what and there is a huge scope for this vlsi and even the growth in this field is fast.